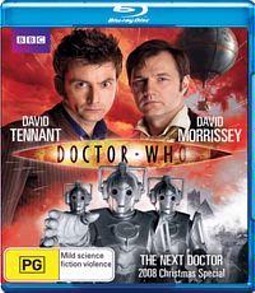 Another Christmas special arrives on Blu-ray with our favourite Doctor Who, played by the delightful David Tennant to add to our collection. Doctor Who the Next Doctor is set in Victorian England and one of the Doctor’s most nefarious enemies has invaded this timeline… the Cybermen. This story also features the “next” Doctor and I must admit that I was a little excited when I first read about this premise because I was expecting the Doctor to team up with another version of himself… unfortunately I was wrong. The “other” Doctor (Morrissey) is actually a surgeon of the era. Unlike the other Christmas specials, Doctor Who the Next Doctor is a little bit of a hit and miss affair because the camp factor of the story. Whether the writers were attempting to cram too much story in or if it was just the mediocre plot, you would think that the Cybermen in Victorian England would cause more fuss with the local denizens then they did... especially with the "King". There was however, one standout character in this story and that was Miss Hartigan (Dervla Kirwan) who plays one of the co-villains in this story and is actually more menacing and villainous than the Cybermen themselves. As a Doctor Who, it would have been more interesting and for better plot development if she was the real ringmaster behind this invasion to merry old England. However, without spoiling the story and more, the Doctor and his colleagues who he has once again dragged into this mess, must set things right in Victorian England but just be warned… the ending is very much like Ghost Busters. The video quality of Doctor Who the Next Doctor is right up there with the best of them with glorious widescreen, vibrant colours and larger than life sets. The sound track matches the impressive quality of the video and BBC are definitely one of the better companies for video and audio quality. Add in the two featurettes that include Doctor Who at the Proms and Doctor Who Confidential and although they are nothing special, the confidential episode gives you nice little insight into the series. Not bad for one movie! Even though this story had the actors, the plot really didn’t mesh very well with the era which is a crying shame to fans of the Doctor. However if you can put these issues to the side, than Doctor Who the Next Doctor can still be enjoyed but just remember… once you have watched it, you’ll probably forget because it’s not that memorable… or perhaps the Doctor used his sonic screwdriver on you?